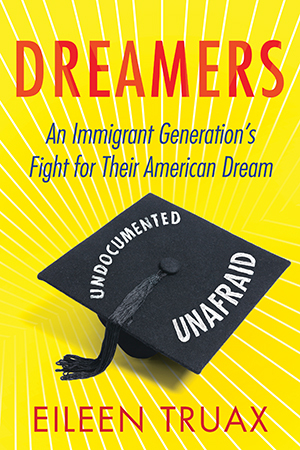 THERE ARE ABOUT ELEVEN MILLION undocumented people living in the United States. You can’t tell who they are just by looking at them, but we know they are here. As you walk down the street, ride the subway, or drive on the freeway, you may see them coming home from work, picking up their kids at school, waiting at the bus stop, cooking or cleaning rooms at fi ve-star hotels, or even running a little business out on the corner. While it’s impossible to pinpoint exactly who’s undocumented and who’s not by sight, we know one thing with certainty: our daily lives wouldn’t be the same without them. political pawns. No president has dared to propose a process of massive deportation, nor has any administration openly recognized the essential role this cheap, effi cient labor force plays in the national economy. Undocumented immigrants have become the political currency of private negotiations between Democrats and Republicans, legislators and government agencies, and in campaigns for office. And except for when election time rolls around and minority voters must be courted, especially Latinos, immigration reform is a hot potato no politician wants to touch. a demand for their labor. It didn’t develop effective strategies to control illegal crossings along the border with Mexico. No sanctions were enacted to punish employers who hired undocumented workers, and the labor resulting from the exchange of falsified documents has become an essential moving part of the national economy’s machinery. Almost three decades later, the number of undocumented immigrants in the United States fluctuates between eleven and twelve million; six in ten are from Mexico. Many of them work in agriculture, manufacturing, construction, or the service sector. Undocumented workers make up almost 5 percent of the civilian labor force. They are men, women, and teens who came here one, two, fifteen, or twenty years ago. Sometimes they stay here for relatively short periods before returning to their countries of origin to be with their families for a while, or to try and make a go of it there. But they end up coming north again because, even though they must live in the shadows, under the constant threat of deportation, they can earn enough money here to provide the loved ones they left behind a better standard of living. children on what I make here,” she explained. unemployment and general lack of opportunity in the local communities. And the migrants’ mere absence provides economic relief to the state, which does not have to provide basic services to the millions of citizens not residing in the country, such as public education for hundreds of thousands of school-age children, a cost now assumed by communities in the United States. The migrants’ countries of origin tend to wash their hands of whatever may happen to their citizens once they set foot on US soil, as if their own governments no longer bore any responsibility for them. Far from recognizing the double sacrifice that migrants make by taking the risk to seek out a better life and then generously supporting their communities back home, people in their countries of origin often refer to them on Internet pages or in public debates as cowards and traitors.